Plenty of iOS apps let you remotely access your Mac (as well as Windows and Linux PCs), and the iPad is an excellent platform for them: Because the tablet runs all of its programs full-screen, a remote-control app turns your iPad’s screen into your Mac’s. But while there are lots of these apps, one thing differentiates the best from the rest. Virtually all remote access iPad apps rely on Virtual Network Computer (VNC) technology for remote control. VNC is built into Mac OS X (for the past several versions, at least); it’s what makes Screen Sharing possible, among other things. But while VNC makes it relatively simple to connect to a Mac that’s on the same local network as your iPad, it doesn’t help as much when you need to connect to one that’s not. Most VNC apps discover and connect to computers using Bonjour; once you’re outside the network, Bonjour doesn’t work. That means it’s time to get your hands dirty. To reach a computer on one network from an iPad on other means configuring that distant router to let you in. That means messing with ports, dynamic DNS, and other arcana that make many users uncomfortable. It’s not only messy, but you may have to do it repeatedly. 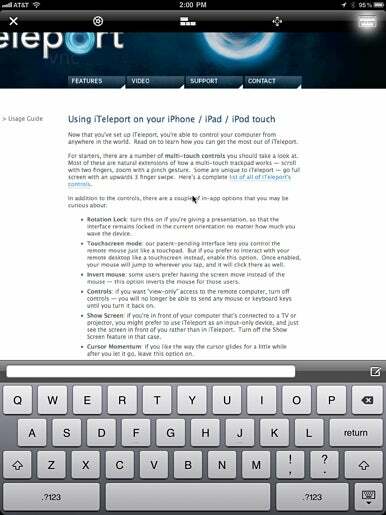 That’s why I recommend just two remote-access apps for the iPad: LogMeIn Ignition ( ; $30) and iTeleport: Jaadu VNC ( ; $25). They might seem expensive compared to most iOS apps, but they’re cheap for what they can do: Both let you connect to a remote Mac on another network with virtually no effort on your part. To use LogMeIn, you need an account (free) and a desktop client. It uses proprietary technology, not VNC, so you have to install software on whatever Macs or Windows systems you want to reach. That software comes in several flavors; there’s a free desktop version that is quite full-featured. You need to set up an account because LogMeIn uses its own servers to mediate the connections between systems. Once you pay $30 for the app, you can access any number of desktop systems running LogMeIn Free from any of the iOS devices registered to your iTunes account. I’ve used Ignition extensively ever since it was released, and I’ve never had trouble making a connection back to a computer on which LogMeIn was installed. A recent update added file-access capability; that means you can browse machines to which you have access, and view and copy files from them to your iPad. Typing on a remote Mac from iTeleport. iTeleport is a full-featured VNC client, which also takes advantage of Apple’s Screen Sharing extensions for supporting multiple monitors. (Unenhanced VNC clients can only access the monitor on which the menu bar is located.) But while LogMeIn uses its own servers to mediate the connections between machines, iTeleport uses a Gmail account as the glue. It uses Google’s systems to let the two machines negotiate a connection without port mapping or other router fussiness. The connection itself doesn’t pass over Google’s servers, however. It seems to work well. The company provides free Mac OS X and Windows server software, which you register with a Gmail account’s login name and password and install on the Macs you want to reach. iTeleport will also works with standard VNC clients on any platform, although you then have to configure the connections yourself. In some ways, it’s surprising that remote access is still so hard. I’m not alone in wishing Apple would extend either Back to My Mac or iChat screen sharing to iOS. But unless and until Apple steps in, LogMeIn and iTeleport remain excellent choices. They let you use your iPad as a roving screen for one or more computers you own or to which you need access, whether you’re a few feet away or in ultima Thule. Both are well worth the price. Glenn Fleishman is a senior contributor to Macworld, and the author of Take Control of iPad Networking and Security (Take Control Books, 2010).